In the watch world, there are so many dive watches that all look the same. Starts to get a little boring sometimes, so I went searching for something that would stand out a bit more then the rest. I ran into a brand that honestly, I have never heard of. DELTAt was that brand, and their Umi diver is the watch that caught my eye. 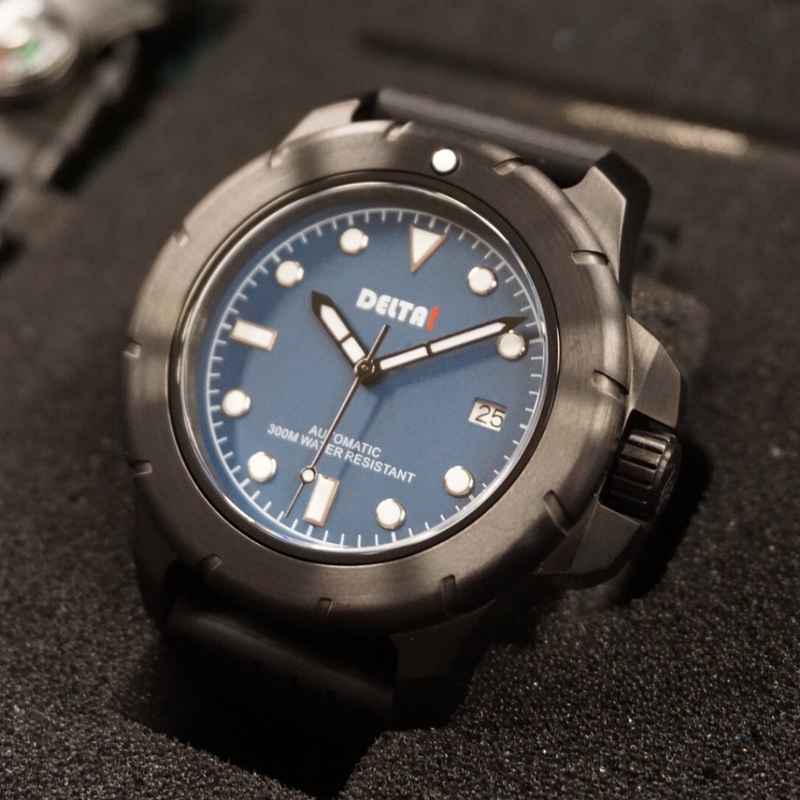 I reached out to DELTAt and was able to get a hold of a cool-looking black Umi diver. When I opened up the box, I was very surprised how nice this DELTAt Umi looked in person. This has a look of a watch that has a job to do. For sure this is not a dress watch. With the black case and matte blue dial there is a tactical look to it that I really like. I really like the style of the bezel, but with it being so rounded off, will there be enough grip to rotate while diving. Aside from that it really looks great. Normally I am not really into black cases, but I do like this one. The case is made from 316L stainless steel with a black brushed finish which just works so well with the look of this watch. It has a screw down crown with large crown guards. Build quality is excellent and this case has a water resistance of 300 meters. This DELATt Umi Diver is powered by the very reliable Seiko Automatic NH35A movement. It’s not customized at all, but it’s still nice to look at though the exhibition case back. Some watches come with an extra strap, which is nice, but this DELTAt comes with two extra straps. This gives you three different style straps: a black rubber waffle strap, a nylon velcro strap, and a paracord strap. The black waffle strap is durable, flexible, and fits comfortably on the wrist. If you want something to truly wrap your wrist, then the velcro strap fits perfectly. Now, if you are the survivalist type, you will love the paracord strap. The clasp on the paracord strap hides a few cool tools. Built into the clasp is a compass, a very loud whistle, and a flint and steel fire starter. That’s just too cool. DELTAt has lume applied to the hands, hour markers, and on a single dot on the bezel. The glow is nice and bright, and does last quite a long time. If you are looking for a dressy watch, this is not for you. If your a diver, survivalist, or all around outdoor type then this can do it all for you. With three straps to suit your mood and great build quality this is a pretty good deal at $480 USD. If you like what you see go check it out at deltawatch.com. Who’s it for: Divers and outdoor types. What I’d change: A little more grip on the bezel. The best thing about it: The bezel design.